This Passion Fruit Mocktail Recipe is a perfect option for people that don't drink alcohol, and will be a hit at your BBQ this Spring. 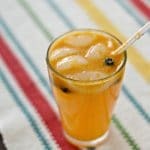 1/2 of the cup you are using of Welch's Refrigerated Cocktails - Passion Fruit variety. Combine the Welch's Refrigerated Cocktails with the lemon-lime soda and mix well. Add the blueberries and serve cold with ice.